Turkish-backed rebels said Sunday they expected to finish withdrawing heavy weapons from a planned buffer zone in northwestern Syria within days under a deal to stave off a regime attack. Regime ally Russia and rebel backer Turkey reached the agreement on September 17 for the northwestern region of Idlib on the Turkish border to avert what many warned would be one of the worst humanitarian disasters of Syria's seven-year conflict. But Syrian President Bashar al-Assad said on Sunday the deal for the country's last major opposition bastion was just a "temporary measure" before the government retook the region. "The agreement is a temporary measure through which the state has realised many achievements on the ground starting with stemming the bloodshed," state news agency SANA reported Assad as saying. Idlib "and other Syrian territory still under terrorist control will return to the Syrian state," he reportedly said at a meeting of the central committee of his Baath party, employing the regime's usual term for both rebels and jihadists. Last month's agreement is to create a 15 to 20-kilometre (9-12 mile) demilitarised area ringing the Idlib region. Under the deal, all rebels in the buffer zone must withdraw heavy arms by Wednesday, and radical groups must leave by October 15. The National Liberation Front (NLF) announced Saturday that it has begun withdrawing heavy arms from the zone as part of an agreement between Russia and Turkey. "We began to withdraw our heavy weapons from the demilitarised zone to rear positions," NLF spokesman Naji Mustafa told AFP. "The operation will last several days," he said, adding that the weapons will be held by fighters deployed in positions outside the demilitarised zone. The NLF is the main Turkey-backed rebel alliance in the Idlib region, but jihadist heavyweight Hayat Tahrir al-Sham (HTS) holds a large part of the province and the zone. The Idlib region includes most of the province of the same name, as well as adjacent parts of the Hama and Aleppo provinces. On Sunday, an AFP correspondent saw NLF fighters on the frontline inside the planned buffer zone on the Idlib region's eastern flank. 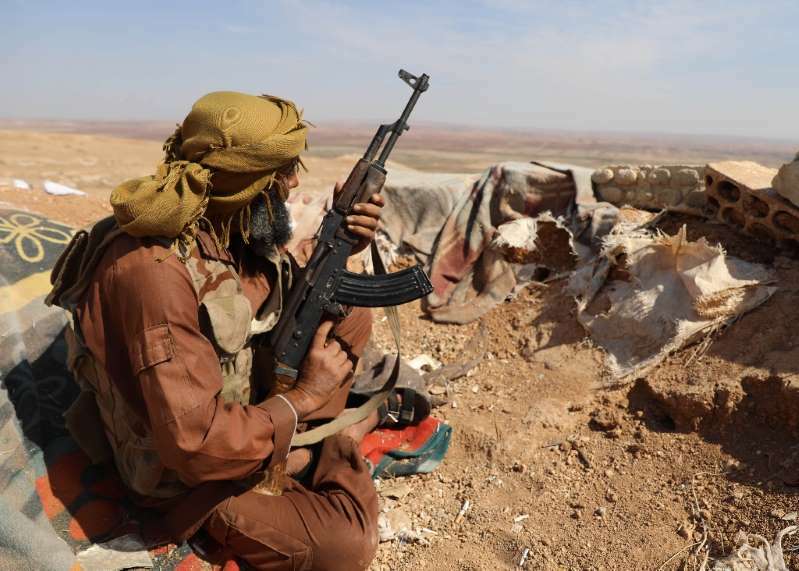 They waited in trenches armed with light weapons on a hill in the area of Al-Eis in Aleppo province, overlooking regime-held territory several kilometres (miles) away. The correspondent did not see any heavy weapons in Al-Eis. "According to the set deadline, the withdrawal of heavy weapons will end on October 10. The operation is ongoing," an NLF commander on site told AFP. "We are reinforcing our positions and are ready to face any violation" from the regime side, he added. In recent weeks, Turkey has deployed troops at "observation posts" it set up in rebel-held areas of Idlib and neighbouring Aleppo. Nawar Oliver, an analyst from the Turkey-based Omran Centre for Strategic Studies, said pro-Ankara fighters giving up their heavy weapons on the front line leaves them vulnerable to a regime attack. But "the Turkish military should have some kind of heavy artillery" with them, he said. On Saturday, a media spokesman for Faylaq al-Sham, one of the NLF factions, confirmed the withdrawal of arms. Seif Raad said it included pulling back missile launchers, tanks and mortars. The Syrian Observatory for Human Rights war monitor said the withdrawal of weapons had already started a week ago and would continue for several more days. "But the rebels only hold a third of the buffer zone," the head of the Britain-based monitor, Rami Abdel Rahman, said. HTS and other jihadists, who control around 70 percent of the planned demilitarised area, pose the main challenge to its implementation, he said. None have accepted the Russia-Turkey deal, yet they are expected to withdraw from the zone by October 15. Syria's war has killed more than 360,000 people since starting in 2011 with the brutal repression of anti-government protests.